For Kinect for Windows v2 and Kinect for XBox One (with separately available power adapter) sensors. 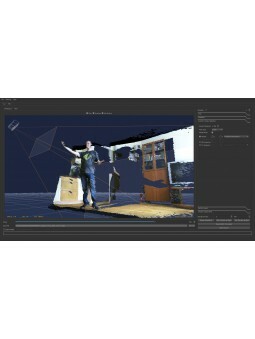 Brekel Pro Pointcloud is a Windows application that records 3D pointcloud using a Kinect sensor, and export them to popular mesh-cache and particle-cache formats for use most 3D packages. Comes with Unity integration (script/shaders) for file playback, compatible with Unity 2017/2018/2019, Windows, Android, iOS, macOS, VR headsets (HTC Vive, Oculus Rift/Go, WindowsMR), HoloLens, Magic Leap.